There’s a certain kind of fear that strikes when you’ve just finished doing your business in the bathroom and the toilet won’t flush. The toilet is clogged and it’s seemingly your fault… how embarrassing. Good news is, it’s probably not just your fault because it’s a result of more than just human waste and toilet paper. Many plumbers can testify that they’ve seen clogs that were 100% preventable if people didn’t flush things that aren’t supposed to be flushed. Most of the time, common sense can be used to determine if something shouldn’t be flushed, like cell phones and toys (you’d be surprised how often common sense is neglected thought). But some other items are tricky. 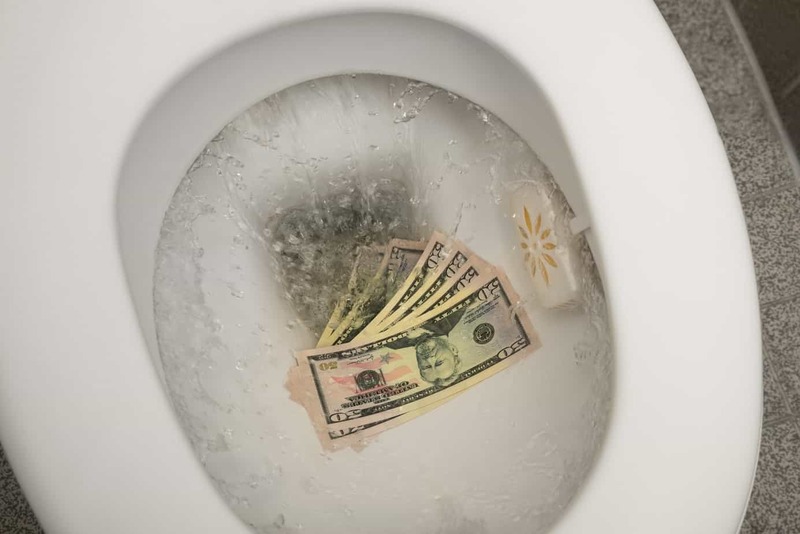 Here are 20 items you should stop flushing down the toilet. Flushable Wipes – Believe it or not, these wipes aren’t as “flushable” as they advertise. The reason being that these wipes do not disintegrate as well or as quickly as toilet paper and is more likely to clog your toilet. Throw the flushable wipes in the the trash, not the toilet! Feminine Products – Menstrual products are made to absorb liquid, not break down in it. Once flushed, the products are more likely to expand and get stuck in the the plumbing line. Dental Floss – Although seemingly harmless, dental floss can get caught and then become a net and catch other waste coming down the line. It can ever wrap around parts of the septic system and cause the motor to burn out. Condoms – Condoms are not designed to break down in water, or really break at all. Flushing condoms is just a terrible idea. Your Dead Pets – Give your fish or other small pet a decent burial in the garbage can or the yard. Animals will not disintegrate in water, especially the fish who lived its whole life in water. Don’t let your dead pets haunt you with a clogged toilet. Kitty Litter/Waste – Even if the kitty litter is “flushable”, it’s not water soluble and most plumbing systems don’t use enough water or power to properly move the litter out of the system. Kitty litter dehydrates cat poop, making it as hard as a rock and nearly impossible to break down. Don’t flush kitty litter, cat poop, or rocks. Diapers – To all the new parents out there, we understand you’re tired but your baby’s diapers should be in the trash or diaper pail–not the toilet! Diapers absorb water and will only cause problems in your septic system. Oil & Grease – Cooking grease solidifies when it cools down and many people already know not to pour it down the sink. So flushing it down the toilet is just asking for your toilet to be clogged. Paper Towels & Tissues – There’s a reason why these items are not interchangeable with toilet paper. They absorb, not break down. We can’t reiterate this enough! Medication – Toilet water does not break down pills and medicine properly, allowing it to potentially get stuck somewhere in the pipes. Additionally, the medication can cause toxic environmental effects. If you need to get rid of old pills, turn them into the DEA for proper disposal. Cotton Balls – Much like the “flushable” wipes, cotton balls, cotton pads, and the like do not break down the same way toilet paper does. What it will do is clump together in the pipes like cancer cells and cause problems. Cigarette Butts – Cigarettes aren’t good for you and it’s certainly not good for the environment! When you flush cigarette butts, not only can it get stuck in the septic system, you’re adding toxic chemicals to the water system and environment. These butts belong in the trash–not the toilet! Money – Now this is just a waste of money, literally. Your dollar bills and coins shouldn’t be flushed into the toilet because it won’t break down! Empty your pockets before sitting down and things from accidentally falling out of your pockets. Hair – Hair is the worst, really. It tangles together, forming a net and gets caught on everything while catching everything else. It’ll never dissolve either. Hair goes in the trash if it’s not on your body. Gum – The reason why gum is “long-lasting” and can be chewed for a long period of time is because it’s non-water-soluble. It won’t break down in the plumbing system and get stick to your pipes and cause a clog. Paper and Photos – First of all, you should recycle paper. Second of all, you should burn those photos of your ex (it’ll be more satisfying). Paper and photos don’t break down properly and belong almost anywhere else besides the plumbing system. Bleach or Other Harsh Chemicals – SURPRISE! Your toilet can be a shiny white bowl without the bleach. Bleach is a very harsh chemical that is toxic and does not belong in the sewerage lines or septic systems. Your toilet can be cleaned with a simple soap or white distilled vinegar. Band-Aids – It’s designed to be durable and sticky, meaning it won’t break down in the plumbing lines and can stick to the plumbing or other things in the pipe lines. Toilet Paper Roll – Unlike the rest of its being, this brown piece of cardboard is just meant to hold the toilet paper. It won’t break down and can cause more problems than you might think. Each flush uses up to three gallons so stop wasting water flushing things that shouldn’t be flushed! The only three things that you should flush down the toilet are: poop, pee, and toilet paper. If you need help with your plumbing system, don’t hesitate to contact ProFlo. From clogs to leaks, we serve residents throughout the Temecula and Murrieta area. Give us a call today at (951) 694-1300 for a free quote.